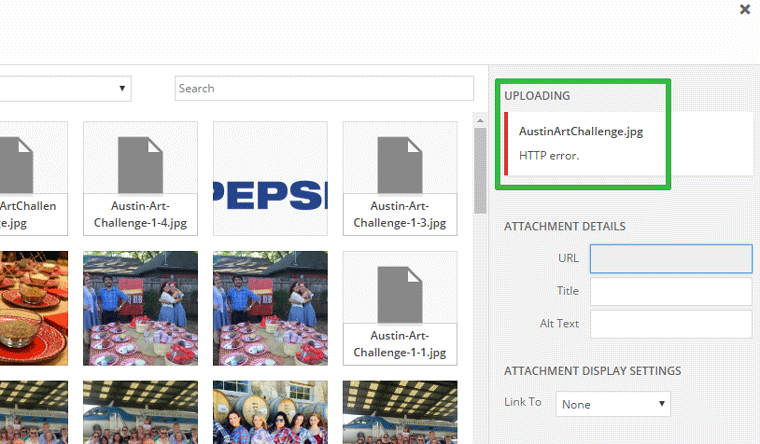 Here’s how to fix the dreaded “HTTP error” when uploading images through WordPress’ media uploader. We’ve seen this with JPG files and it basically boils down to filesize or just a bad file. Shrink the Image: Use Photoshop or Pixlr (online photo editor) to simply shrink the image file size. A 4000×3000 pixel image will often not upload. Run the image through (the amazing) TinyJPG at tinyjpg.com. You won’t change the image dimensions, but you’ll actually shrink the filesize and remove some unnecessary meta information. This process will help your page load faster, which helps with conversions and with SEO. Update your WordPress version to the current version. You can always try converting the image from .jpg to .png or vice versa. Photoshop or Pixlr can help with this. As a last resort, when all else fails, display the image and do a screen capture with “ALT+PrtScrn” buttons or a screenshot extension in chrome and then generate a new file. If this doesn’t work, I WOULD BE SHOCKED. After countless code’s to the .htaccess, wp-config or what so ever. Nothing worked and got near the point of just burning the server down.